Hat hier noch niemand kommentiert, oder sehe ich das nur nicht? Auf jeden Fall finde ich The Brap Challenge super, und ich freue mich schon auf meine Belohnung - und natürlich auf das nächste Mal euch live zu sehen!!! This project ended successfully on 29/5/2015 08:00! Mixtape of your favourite Pullup member plus our new album «The Brap LP» as CD. You get a personal birthday message on video plus our new album «The Brap LP» as CD. Enjoy some inside tour stories with Soulfill Franklin incl. beer or wine plus our new album «The Brap LP» as CD. Walk-on part in a videoclip plus our new album «The Brap LP» as CD. Rub A Dub Party at Kraftfeld Winterthur with Samwaah and Soulfill Franklin including ticket & 4 beer for 2 people (date after arrangement) plus our new album «The Brap LP» as CD. Party in St. Gallen with Samwaah and Mellow Dee including ticket & 4 beer for 2 people (date after arrangement) plus our new album «The Brap LP» as CD. Party in Bern with Smocky and Tronic including ticket & 4 beer for 2 people (date after arrangement) plus our new album «The Brap LP» as CD. Party in Zurich with Samwaah and Iva Iverson including ticket & 4 beer for 2 people (date after arrangement) plus our new album «The Brap LP» as CD. Enjoy a percussion lesson of 60 minutes with Webster in Lucerne plus our new album «The Brap LP» as CD. Enjoy a trombone lesson of 60 minutes with Iva Iverson in her rehearsal room at Basislager in Zurich plus our new album «The Brap LP» as CD. Enjoy a percussion-drum lesson of 60 minutes with Lucky Ringo Star in Zofingen plus our new album «The Brap LP» as CD. Enjoy a trumpet lesson of 60 minutes with Soulfill Franklin in Winterthur plus our new album «The Brap LP» as CD. A shoe shopping tour with Samwaah! in Zurich including lunch and advice plus our new album «The Brap LP» as CD. Enjoy a singing lesson of 60 minutes with Mellow Dee in St. Gallen plus our new album «The Brap LP» as CD. Enjoy a tuba lesson of 60 minutes with Big Boy in Bern plus our new album «The Brap LP» as CD. Enjoy a saxophone lesson of 60 minutes with Adrix in Biel plus our new album «The Brap LP» as CD. One weekend windsurf crash course for 2 people with the bandleader at Untersee (date after arrangement) and our new album «The Brap LP» as CD. Pay bribe for radio moderator and get glory and honor plus our new album «The Brap LP» as signed CD. We visit your garden or living room for an intimate concert. Plus our new album «The Brap LP» as CD. We play at your company anniversary, store opening or staff party. Date after arrangement. 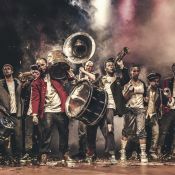 mixture of brass band sounds and Hip Hop – to inspire audiences of all ages!